Pulled pork differs in flavor depending on regional recipes, but the basic concept is universal – seasoned, smoked or slow-cooked pork that is pulled from the bone or from a boneless roast and shredded. Cooking pulled pork involves enough work that making more than you need for one meal makes sense. 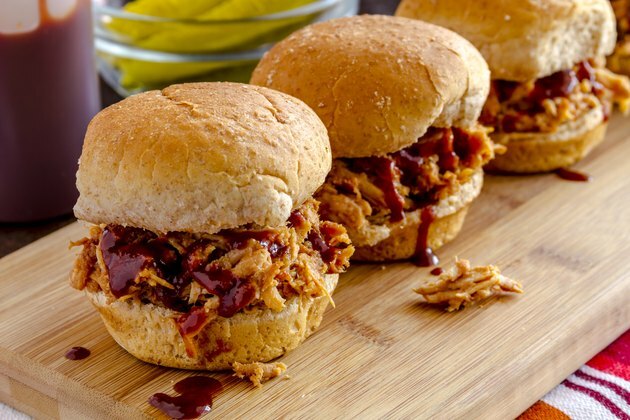 Reheating pulled pork can be tricky because it can dry out and get tough, or become too soft and rubbery if not treated right. Moistening pulled pork, then reheating it in a skillet, ensures it will retain its taste and texture. Coat a heavy skillet with a light spritz of nonstick cooking spray. Pour an inch or two of broth or gravy into the bottom of the skillet and turn the heat to medium-high. Let the liquid come to a slow boil. Put your pulled pork into the bubbling liquid and stir it quickly to coat it all evenly. Cook and stir the pulled pork for three to five minutes. Turn the heat off and cover the skillet. Let the pulled pork sit for five to seven minutes or until it is heated through. Poke the very tip of an instant-read thermometer into random piles of the pulled pork to ensure it has reached a safe temperature of 145 degrees F.
Add a splash of wine to your pulled pork as it heats to refresh the flavor. Do not use water to reheat pulled pork because it will dilute the seasoning.